Imo state governor, Rochas Okorocha, said Thursday, that the time has come for his son-in-law, Mr. Uche Nwosu, to be the next governor of Imo state. 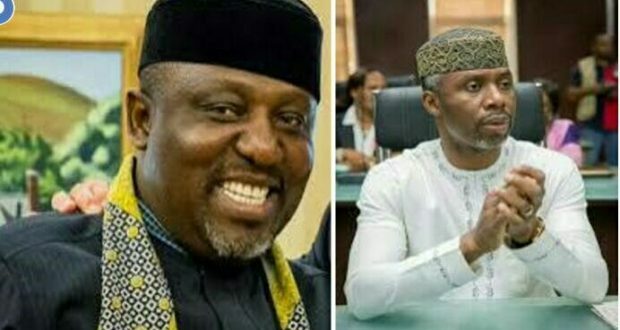 Okorocha Okorocha in a release to newsmen in Owerri, through his Chief Press Secretary, CPS, Mr. Sam Onwuemeodo, was apparently reacting to a statement credited to a group, called Restoration Coalition of APC, that vowed to stop the endorsement of his son-in-law, Nwosu, to be the next governor of the state. The governor bragged that the group was only envy of his son-in-law. Okorocha defended his support for his son-in-law that, “Endorsement is a Public Statement or action showing support of something or somebody. It has been part of our democracy. “And it is surprising that some people have been loosing sleep over the several endorsements the young Uche Nwosu has been getting. The difference is that his own endorsement is like a revolution, and almost all the other aspirants are feeling threatened.” The release viewed it as an attempt “To deceive the weary and indeed the general public. They should have gone ahead to also endorse their own candidate. “What is their headache. Is Governor Okorocha the only governor who has indicated interest in one of the members of his Political family to succeed him. “They should follow events in other States. And also do their political research. Endorsement has been there. And they should ask their Candidate to withdraw if he is not popular to the extent of attracting people to endorse him. Uche Nwosu is the man. This is his time and nobody should envy him.” Adding that, “They are habitual Coordinators of guber aspirants. They cannot Contest election.